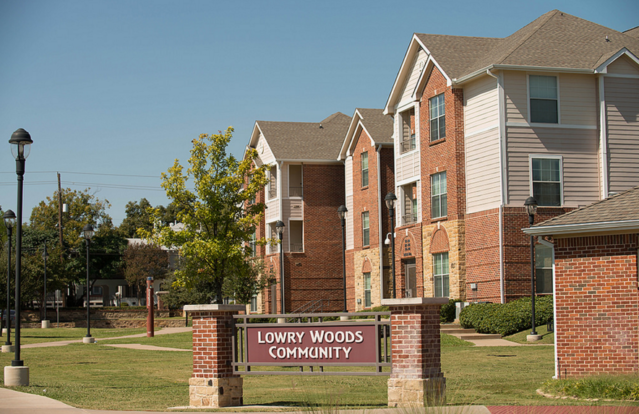 The Lowry Woods Community* is the newest residential community on campus and has 168 fully furnished units comprised primarily of two and three bedroom apartments that house approximately 308 residents. The Lowry Woods Community features a large community area complete with computer lab, television lounge, activity deck, and a classroom for “The Clubhouse” after school and summer day camp program. In addition this fully furnished facility offers laundry rooms in each of the 7 buildings; full kitchens in each apartment; data ports and wireless for internet access, and cable television. For Fall 2016, a Sophomore Year Experience program will begin; connecting residents with similar majors or interests. These connections tend to create stronger ties to a residents field of study and to TWU.